Home » animalia » mymaridae » Species » tinkerbell fairyfly » Tinkerbell Fairyfly: Do You Believe in Fairies? How it made the Top 10: The tiny size and delicately fringed wings of the parasitoid wasp family Mymaridae led to their common name: fairyflies. 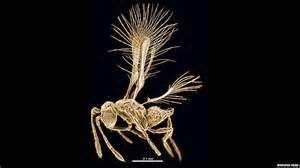 Tinkerbella nana, named for Peter Pan's fairy sidekick, measures just 250 micrometers (0.00984 inches) and is among the smallest insects. It is the latest addition to the 1,400 or so known species of the family. The new species was collected by sweeping vegetation in secondary growth forest at LaSelva Biological Station in Costa Rica. Although its host is not yet known, like other fairyflies it presumably has a life span of not more than a few days and attacks the eggs of other insects. Etymology: Genus name refers to the fairy Tinker Bell in the 1904 play "Peter Pan" by J. M. Barrie. The species name refers to the dog Nana in the play and, coincidentally, to the Greek word nanos meaning dwarf. Reference: Huber JH, Noyes JS. 2013. A new genus and species of fairyfly, Tinkerbella nana (Hymenoptera, Mymaridae), with comments on its sister genus Kikiki, and discussion on small size limits in arthropods. Journal of Hymenoptera Research 32: 17–44.